If you have a barn or stable, you can save a cat and control your rodent population at the same time! Sometimes cats cannot live as household companions, yet make excellent barn cats and thrive in that environment. These cats may be shy or fearful of people and prefer the company of other cats and animals. By adopting barn cats, you can also control your rodent problem without toxic chemicals. Generally speaking, barn cats placed through the Wisconsin Humane Society’s barn cat program are independent cats who prefer to limit their interactions with humans. However, the degree to which they keep their distance varies from cat to cat and may change over time. Even those who prefer to keep their distance may develop bonds with their caregiver after positive encounters with people. Barn cats often develop strong bonds with other cats, which is why the Wisconsin Humane Society recommends that at least two cats be placed together. 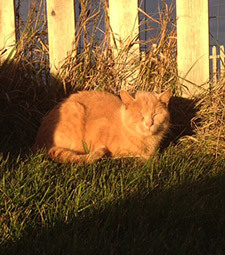 All barn cats available for adoption are spayed/neutered, ear-tipped, tested for FeLV, microchipped and vaccinated. When you adopt barn cats, we also provide consultation on how to successfully acclimate them to their new home. If you are looking for a barn cat and would like to be notified of availability, please email us at barncats@wihumane.org. Please also fill out our Adopter Profile. Please share this flyer with family, friends, coworkers - anyone who might be interested in the program! Thank you for your support!